A new ministry designed to fulfill Galatians 6:2. "Bear ye one another's burdens, and so fulfill the law of Christ"
Sometimes the hard moments of grief are once all the friends and family have left and one is thrown back into the daily routine with their world being turned upside down. Or the relationship has ended and there is a place of emptiness and one begins to question their self-worth. Maybe you’ve gotten the call from work that your services are no longer needed and the questions flood your mind on how will I be able to support myself and my family. Others face depression, anxiety, and abuse every day. Project UPLIFT was placed in our hearts by God to minister to those in need and as our mission statement of Galatians 6:2 says, “Bear one another’s burdens, and so fulfill the law of Christ”. Our goal is to provide high quality Christ-centered care to our congregation through the love of Jesus and to care for one another with the Gospel. We minister to those out of loving motivation with intimate concern for our brother’s and sister’s needs. No matter the struggle, we want you to know you are not in this alone. Some of the areas that our UPLIFT team will minister to are: people struggling through a difficult time in life—experiencing grief, death of a loved one, divorce, job loss, chronic or terminal illness, relationships, or some other life crisis. We want to provide our brothers and sisters who are hurting a compassionate companion, a caring Christian friend who provides emotional and spiritual support. 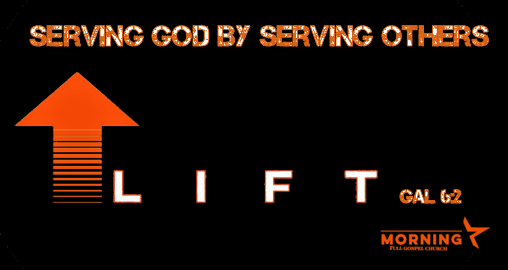 UPLIFT ministers will assist our congregation as Jesus used his disciples, 2x2. (Mark 6:7). We want to love and support you with the love of Jesus. Every session with you is confidential and private. Your hurts and cares are personal and we value that and have vowed to honor that. 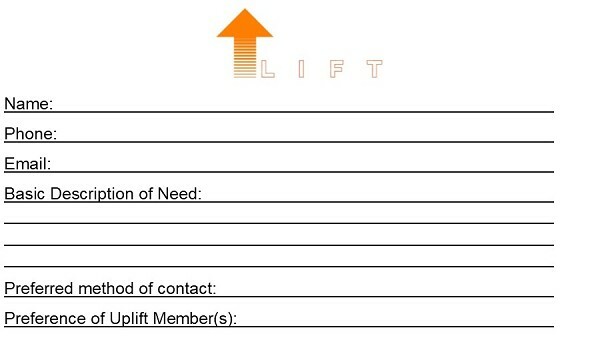 You can have this special ministry provided by simply filling out one of our CARE Cards and placing it in the tithe boxes or reaching by email at uplift@morningstarchurchva.com. We want you to know that you are loved and we look forward to serving.